I've updoaded this image at 2000 pixels wide. Click for a much larger image. Yesterday afternoon, I zipped down to the spillway below Hoover Reservoir. You're looking at the drinking water for a major chunk of the Columbus area. It also happens to be a place where waterfowl gather when much of the reservoir is frozen. While yesterday's temps reached above freezing, we've had a fairly good stretch of subzero temperatures. This drake wood duck stole the show yesterday. It is just a simply stunning bird. This by far is the best look at one I've ever had, and it's simply beautiful. Wood ducks are quite wary, and as this one approached, it had its eye on me the whole time. The platform above the spillway is becoming such a popular and busy place, for both birdwatchers and fitness enthusiasts who climb the dam's long stretch of concrete stairs, that the ducks seem even less wary of people. So, if you've never gone to Hoover, I urge you to, it's a great place to see waterfowl relatively closeup. 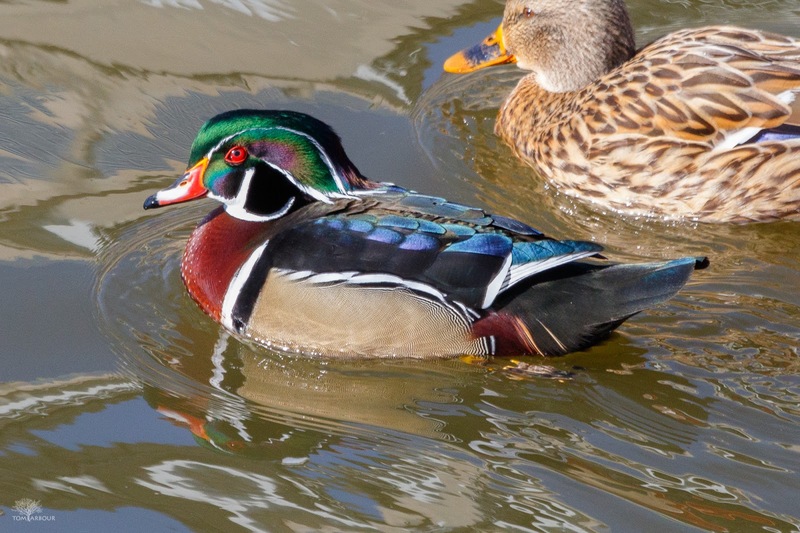 North Chagrin Metropark near Mayfield, Ohio is famous for wood ducks as tame as mallards. I don't know if there are any there now, but worth a look if you're ever up in that direction. Kirsten- I've heard about it- in fact I think it is known across the U.S. as THE place to photograph wood ducks. I'd like to give it a shot someday. It's on my list of places to possibly make a quick to when I'm staying at my parents' place in northeast Ohio. Your picture is stunning! Great job Tom. Thanks Gina- When you're back up on your feet, Hoover is really worth a stop. I can give you a heads up if you're thinking about coming up one day- sometime there are many ducks; other days, not really. The light is best in the winter during the morning. Thank you. I'll let you know when we're going to head up there.